I've been invited to a good friend's baby birthday bash and I need some help in deciding what to get for her little girl who will turn three this February. The last time I went shopping for babies, the saleslady was very helpful; helping me pick out a beautiful diaper bag and a baby blanket as the perfect baby gift. But I was shopping for a newborn then so basically anything practical was welcomed. This time around I'll be shopping for a toddler and I want to get her something that's not only practical but cool enough to make a unique gift for a special baby girl. So instead of the usual toy or game as baby gifts, I'm thinking of something a little pricier but would also make an excellent long-lasting gift like a small toy box with her name engraved or perhaps a tiny rocking-chair for her nursery. I looked around online and found this really sweet rocking chair for children ages 3-6. Featuring soft pastel colours with classic stencil design on top of seat back and heart-shaped cut-outs, the chair will rock to the tune "Rock a Bye Baby" when you pull the heart on the seat! 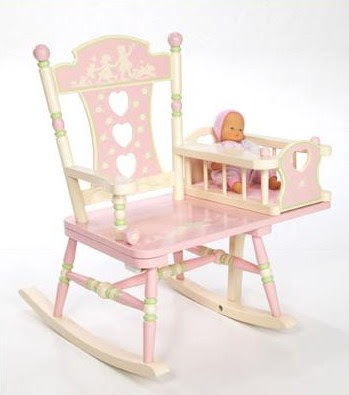 I also love the built-in cradle that lets your child play with her doll while she rocks herself to sleep in this very sweet, very comfy rocking chair. If you have any other cool gift ideas to share with me, do let me know. The birthday party is in three weeks so there's still plenty of time for fickle me to change my mind! but having new Goddaughter is sometimes a >:o >:o >:o >:o for me..coz i need more kaching :-$ :-$ :-$ :-$ :-$ for gifts!!! in some ways, babies are so lovely and giggly..love to pinch their cheeks..haha! LOL haven zzzzzz yet GG!! ;) Soon he he..
eh so cute the rocking chair.. dont mind having one myself.. lol!! How's everything with you dearie? How was B's checkup yesterday? I like the gift you displayed here. It is quite unique and a good choice. I think if I am in your place, I would presnt this above interesting gift. Really nice especially wtih doll and everything, the birthday child is going to love this for sure. I always get headache searching for gifts and presents! Now please don't ask me for any suggestions. I rather not think! LOL!